Shawn Habecker is a life long resident of the Palmyra-Macedon area. On August 2010, he was diagnosed with Ewings Sarcoma, a rare cancer (only 500 people a year are affected). 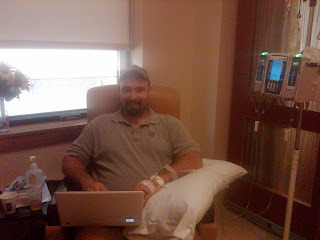 He undergoes two different chemo regiments–one day of chemo with three chemo drugs and a five day treatment with two chemo drugs. They alternate the two different treatments every 21 days. After his tumor has shrunk to an operable size, he will have surgery to remove it. After his recovery from surgery he will resume chemo and radiation treatments. He has now lost all of his hair and has a lengthy recovery. Shawn is an Eagle Scout and currently serves the Boy Scouts of America as an Assistant Scoutmaster for Troop 96 in Palmyra. He has been a Tiger Co-Leader, Cubmaster of Pack 166 in Macedon, and led the Boy Scouts to Philmont Scout Ranch in 2009. Shawn is a fine example to youth in the Scouting Movement and an invaluable mentor. The friends, family, and fellow Scouters of Shawn Habecker will be holding a benefit for Shawn on January 22, 2011 at the Palmyra Moose Club. There will be a spaghetti dinner, dance, and silent auction on that date. Shawn’s health insurance requires a $6,000.00 deductible that has to be paid yearly. We are trying to offset that cost with a benefit. If you would like to purchase spaghetti dinner tickets, please contact Valerie VanDongen at (315) 573-6001 or by email at richval@rochester.rr.com. 1 Comment to "BENEFIT FOR SHAWN HABECKER"